August | 2013 | Old Bat On A Bike. Audax United Kingdom is the internationally recognised long-distance cycling association in the UK. The end of the Audax points collecting year is fast approaching at the end of September, so to try and get my years total to 3000km I am cramming in a few extra rides. In the absence of any local Calendar ride today I did a 100km DIY event. DIY events are permanent events where you plan both the route and the date of the ride. Submitting a completed entry form. Purchasing a brevet card to record your ride. Telling the DIY organiser when and where you wish to ride. Doing the ride and obtaining suitable proof of having done so. Sending the completed brevet to the organiser. This was a DIY by GPS so I recorded the ride on my Garmin Edge 800 (which thankfully behaved itself) and then I send the record of the track to the Audax South West DIY organiser Tony Hull for verification. This entry was posted in Audax UK, Cycling, Dorset on August 22, 2013 by Ian. Audax 200km Permanents:-Valley of the Rocks and Exmoor & Coast. The Valley of The Rocks is an Audax event and takes place in April. It is a 205km route (without getting lost) and it attracts 4 AAA points as it has 3900m of ascent. We were riding it as an Audax permanent in the hot, dry, mid summer. The weather was very hot on the day we left Honiton at 06:00 and headed for Sampford Peverell. Audax rides generally avoid main roads and follow an intricate, often precipitous route through narrow lanes. In the summer-dry and dusty, in the winter-wet, muddy and gravelly. The route was very pleasantly undulating and I enjoyed the shady lanes and cooler early morning temperatures. 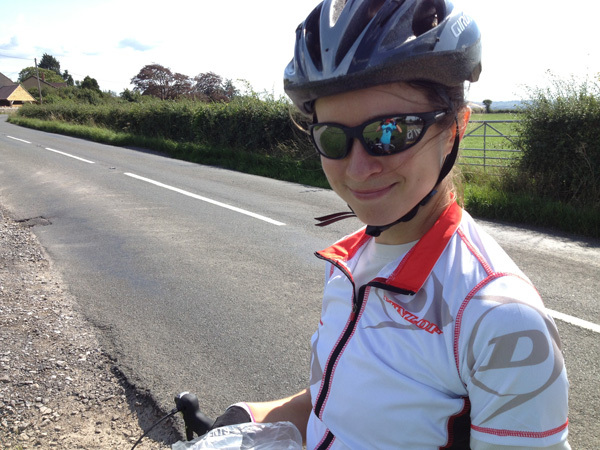 This entry was posted in Audax UK, Cycling, Devon, Somerset on August 2, 2013 by Ian. I have a Garmin Edge 800 bike computer. I had previously owned a Garmin Forerunner 405 which I used principally for running, so the device was not completely alien to me when I got it in October 2012. This entry was posted in Audax UK, Cycling, Running on August 2, 2013 by Ian.